1 pound = 16 oz. 20 tea bags are approximately 1.4 oz. 20 tea bags (1 box) runs anywhere from $2 to $4, depending on the brand. So 1 pound of tea = 228 / 20 * $3 = $34.20. It can be less, it can be more, but that’s about the middle of the road. Wegmans, a wonderful store near me, sells organic loose-leaf tea. Ceylon Breakfast is $16.99/pound. English and Irish Breakfast teas are $39.99 — pretty close to what I paid for Twinings, but whole leaf. Some are more expensive (the most expensive is $149.99/pound, but that’s still only $0.66/cup — far less than you’d pay in any café), but that’s the range I usually use when I shop. The best part about having made the switch (aside from my kids loving to help weigh out and label the tea) is that this gives me a good reason to start using this lovely cast iron teapot my husband gave me a couple of Christmases ago. I’d been waiting for a good time, my desk to be clean, whatever — and now I’m using it on a daily basis. 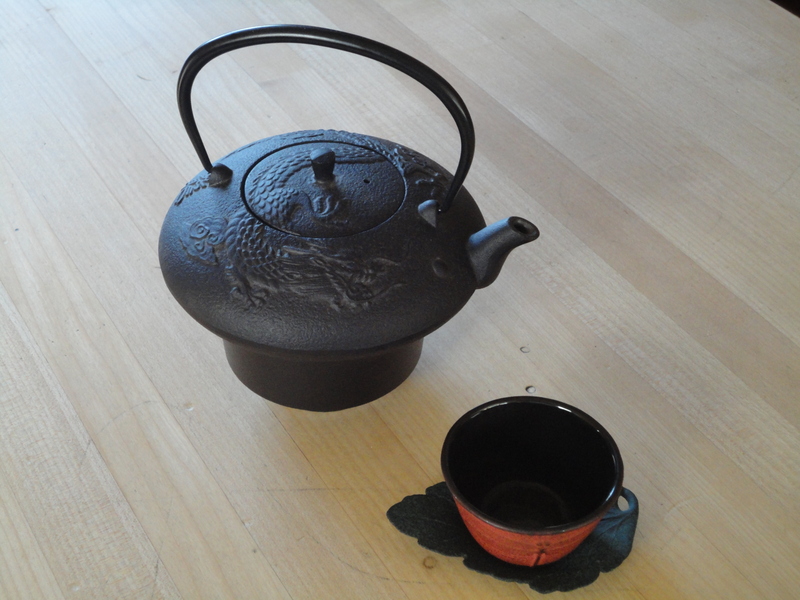 The tetsubin (cast iron teapot) and teacup with saucer my husband gave me. I need to remember to pick up some tealights to use beneath the pot to keep the tea warm — right now, I have to pour the last serving of tea into a normal mug and put it into the microwave — but I’m really loving using this. It’s functional, beautiful, and meaningful: according to Teavana’s page on tetsubin symbolism, the dragon represents power, strength, and good fortune. 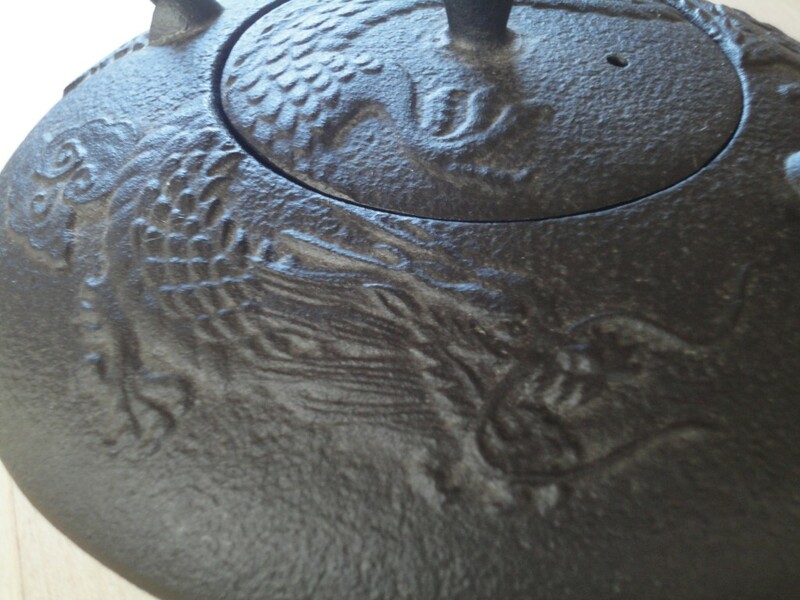 The dragon on my teapot. The dragonfly on my teacup symbolizes good fortune and marriage (and I am very fortunate in my marriage! ), while the tea leaf saucer represents good health. All in all, a lovely way to start each day. 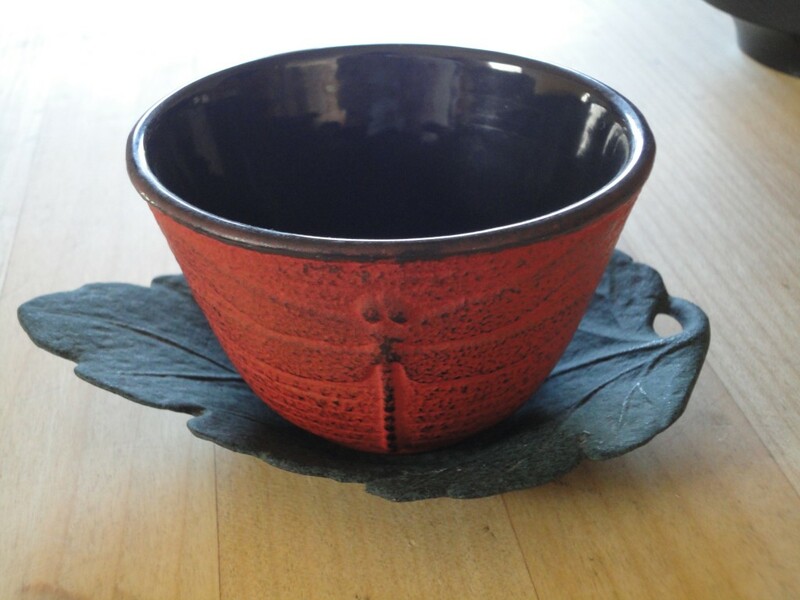 This entry was posted in teacups and tagged teapots, tetsubin by Sara Penhallow. Bookmark the permalink. Oh, those are beautiful. Such a thoughtful gift, too — you are definitely blessed in your marriage. Very nice :). And hmm, I really should switch to loose leaf again. What teas are you drinking now? I don’t know whether Davidson’s carries my herbal tea in loose leaf. Sometimes it is difficult to find what you are able to have locally. My good friend Joan brought me loose leaf in two flavors from one of her vacations. Very good! You might check out the farmers markets, too. You never know what you might find there! I haven’t seen any there, but Thanks! There’s jams, preserves, nut breads, honey (even if they don’r spell it correctly), and way too much lavender (the allergies). I’ll try the Co-op.